KF Mr. Majestic Success 94 is sired by the 2 time ABBA Premier Show Bull of the Year, +KF Progenys Success 40/0. His dam is one of our top donor females, a DR 300 Daughter. This genetic combination of 40 + 300 is producing cattle that far surpass the current standard of breed. 94s paternal sister is one of the best females we have produced. She has a show career with more championships that can be listed. 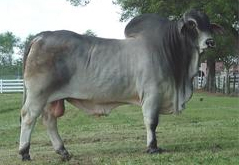 KF 94 will produce top offspring that will be noticed whether it be in the herd or show ring.